Museum Life: To the Moon! 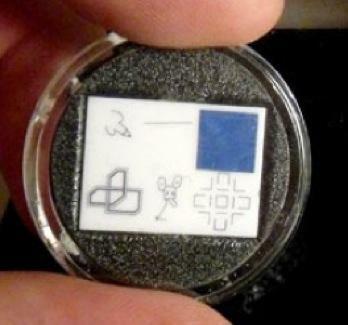 So I just read about the possibility that a mysterious engineer from Grumman Aircraft Engineering Corporation saw to it that a ceramic chip containing mini artworks by well-known artists made it to the Moon on Apollo 12 in November, 1969. According to the story, New York artist Forrest “Frosty” Myers worked with Bell Labs scientist Fred Waldhauer to imprint images of his own (a linked symbol) as well as those by Andy Warhol (his initials as a “rocket”), Claes Oldenburg (a Mickey Mouse), David Novros Robert and Chamberlain (representations of circuitry) , and Robert Rauschenberg (a single straight line). One was supposedly attached to the lunar module before flight, while others were kept here on Earth. History Detectives on PBS looked into it for the Season 8 opening episode airing tomorrow, June 21st. They spoke with Florida art curator Jade Dellinger, who bought one of the purported copies in an online auction, searched out lunar module pilot for the mission, Alan Bean, and visited the Cradle of Aviation Museum in Long Island. The missing link is someone using the name “John F.” in a telegram which stated that the art had made it on board. We still have no definitive proof either way at this point. What is true is that astronauts and space mission crew absolutely did send items to the Moon that had no official part of the mission. 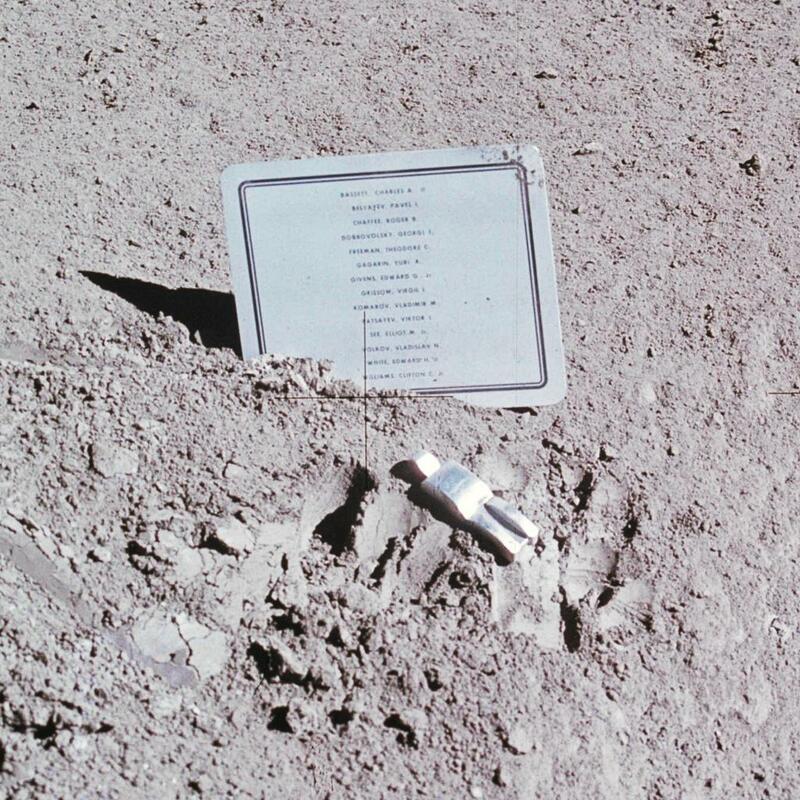 Sometimes with permission, sometimes without, personal belongings such as photos and mementos, even golf balls courtesy of Alan Shepard, launched with lunar modules and remain on the Moon’s surface today. Beyond artwork, space exploration has left over 300,000 pounds of artifacts on the Moon including robots, vehicles, spacecraft, and flags planted firmly into the ground. While we can go to museums such as Air & Space to see photos and replicas, there is also a movement to preserve areas of the Moon as State, National and UNESCO World Heritage Sites. The Lunar Heritage Project at University of New Mexico, funded in part by a NASA grant to the New Mexico Space Grant Consortium, has documented 106 pieces at Tranquility Base including Neil Armstrong’s portable life support system, Buzz Aldren’s space boots and a silicon disc with greetings from 74 nations. The project proposes that we should preserve the collection and archaeological site as we do such cultural remnants here on Earth for the benefit of future generations. In January of this year, California became the first state to name the items left at Tranquility Base as an official State Historical Resource through a unanimous vote by the eight-member California State Historical Resources Commission. Texas, New Mexico, Alabama and Florida are working toward the same goal. All along I have had an international eye on Museum Life. Perhaps its time to go intergalactic. Happy Father’s Day Dad and Colonel Scott!